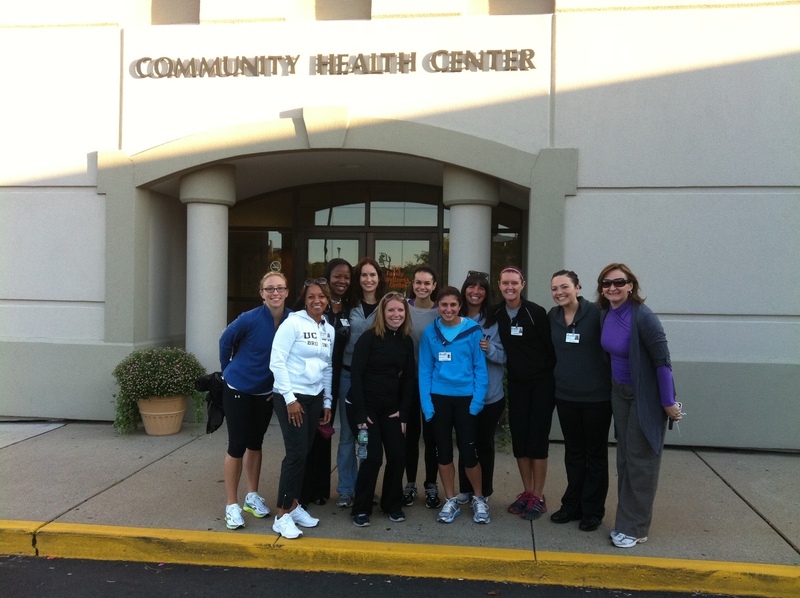 I truly love the autumn season, especially the transition from summer to fall, when you wake up to a crisp, bright morning…Friday morning was the first morning like that of the season and also the inaugural Walk/[email protected] event for CHC! A group of 12 of us (all women, surprisingly enough) gathered at the New Britain site at 7:15 this morning to start our day off on the right foot and celebrate National [email protected] Day, an event created by the Road Runners Club of America to inspire organizations across the country to promote physical activity among their staff. Most of the group walked, a few of us (including myself) ran the loop from CHC through Walnut Hill Park and back. Along the way we had lots of laughs and shared inspirational stories about getting fit and reaching a desired goal. When we arrived back at the health center, Anna Rogers (the event planner) had a wonderful spread of healthy foods waiting for us for breakfast. We sat and ate as a group and spoke excitedly about when we could all get together again for another stroll or jog through downtown New Britain. We tossed around a few options of other ways we could get together for some fitness fun – like participating in a Zumba class (dubbed CHumba – for CHC – by one of the ladies in the group). A few mentioned that this was just the motivation they needed to get into a healthy routine and find ways to work exercise into their daily life…which is really what the purpose of [email protected] Day is! Free tickets to an amazing event on Breast Cancer Awareness!